On December 9th and 10th, historians, teachers and public officials gathered in Ottawa for the 2012 Governor General’s History Awards celebrations. The awards are Canada’s top honors in the field of history and heritage. Rat Creek Press Managing Editor and Ave We Had History Producer Darren Boisvert was in attendance to receive the Community Programming “Honourable Mention” award on behalf of the project team. The two-day event started off at the Canadian War Museum with the 5th Annual Enbridge Canada’s History Forum, where attendees discussed ways to commemorate the upcoming 100-year anniversary of The Great War. The discussion ranged widely from how to engage people in Canada’s history to future ideas for commemorating our nation’s military past. Blake Seward, a teacher from Smiths Falls, Ontario, who won the 2006 Governor General’s for Excellence in Teaching, was a guest panelist who shared his ongoing experiences as the founder of the Lest We Forget project. Started in 2001, he asked his students to research the lives of the names etched onto the World War One cenotaph. The information gathered has been published online (including interviews with family members) and his students have made subsequent visits to France to find the graves of the soldiers they have come to appreciate. “It’s my firm belief that Canadian students don’t like Canadian history because they are told what to think instead of deciding what is important to them,” said Seward. “We should encourage students to ask the historical questions instead of being told ‘what happened’. The day’s discussion ended on an appropriate note, with Jonathan Vance, professor at Western University and author of Death So Noble: Memory, Meaning and the First World War, sharing his thoughts on war commemoration and historical legacy. He noted that there are over 7,000 Great War memorials across Canada, including cenotaphs, tributes, books, films, flags, and scrolls. It took decades for them all to appear in towns and cities across Canada, and surprisingly, had little in common with our current passion for telling a national war story. Recipients and organizers gathered on December 10th at Rideau Hall, the official residence of Canada’s head of state. The Governor General of Canada, His Excellency the Right Honourable David Johnston presided over the event, and was quite visibly enjoying the day’s events. Not a man wedded to the extreme protocols of state, he took time to interrupt his formal entrance to greet an old friend on the way down the aisle. 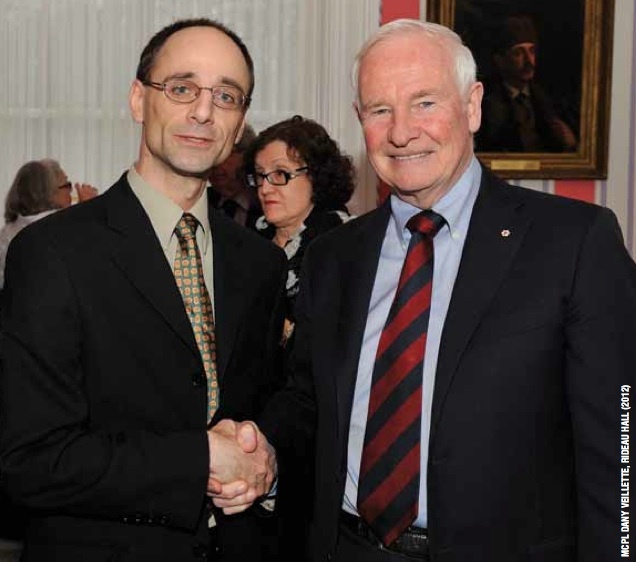 In his opening speech, the Governor General explained his support for the History Awards. “As an educator for much of my career, I would ask my students to consider the historical perspective behind any event. And as Governor General, I often draw insight from Canada’s history in my speeches and remarks across the country and abroad. After the ceremony, the guests were invited to a lunch reception, and the Governor General graciously allowed the guests to wander Rideau Hall to view the incredible collection of Canadian paintings, sculptures and installation pieces. Most guests ended up in the three greenhouses attached to the residence, where they spent time looking for the large number of plastic dinosaurs hidden in the foliage. According to the greenhouse gardener, the grandchildren of the past three Governor Generals have created and added to this paleontological collection. The weekend ended with a gala dinner inside Canada’s War Museum, hosted by National Post columnist Andrew Coyne, where recipients and guests were treated to a fine meal and a musical presentation of 400 years of Canadian music.